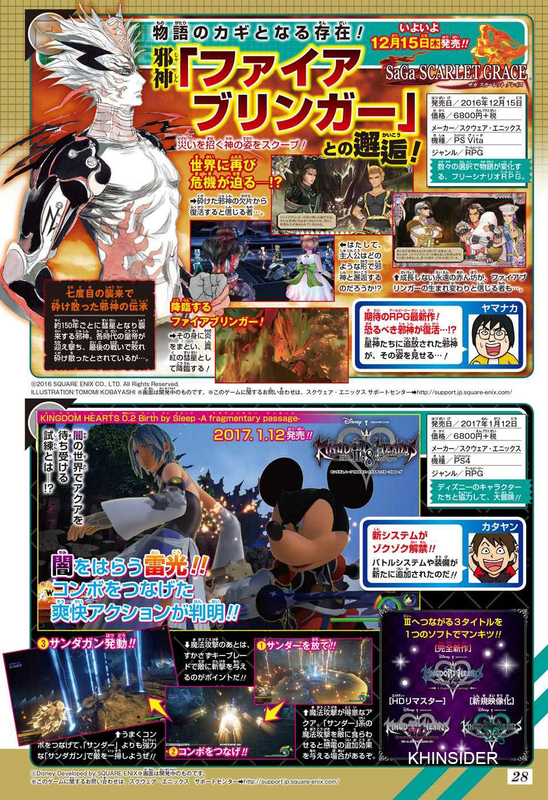 News ► KINGDOM HEARTS 2.8 featured in Jump! KINGDOM HEARTS 2.8 is briefly featured in this week's issue of Jump, focusing on the combat of KINGDOM HEARTS 0.2 Birth by Sleep -A fragmentary passage-. Thanks to Saken for the translations! "Finally unveiling the thrilling new game systems! A fresh new battle system, as well as customization have been added!" Get your fill with 3 titles, all of which are directly linked to Kingdom Hearts 3, in one complete package! What kind of trials await Aqua in the Realm of Darkness...!? Deliver exhilarating attacks by lining up combos! 1. Fire off a Thunder spell! related spell in the face could leave them in an electrocuted state! 2. Link up with a combo! to earn points towards your finale! 3. Burst out with Thundagun! decimate foes with the destructive force of [Thundagun]!! KINGDOM HEARTS 2.8 will be released on January 12 in Japan, January 24 in North America and Europe. He is in the middle of a fight so probably because of that. Nothing too deep probably. After an intense analysis of the screenshot in question, I've concluded it is because he can't see past his own nose. Dear God. For a moment I thought that evil looking man in the upper part of the scan was the coatless MoM xD Until I realized they're different contents, lol. Mickey looks surprisingly good in that pic. Whose the leader, of the club, that's very an-g-ry? M I C, K E Y, M O U S E.
Jokes aside, I'm sure that its due to him being in the middle of a fight..on destiny islands. Tfw you see this one scan and it has you re-watch all of the trailers and hypes you to no end. So, I'm not the best at Japanese obviously. Here's what the boxes say: "Release Thunder, connect it with a combo, invoke Thundagun." The text under box 3 says something along the lines of "Connect a combo successfully after using Thunder and you'll clean up enemies with the more powerful Thundagun." I'm guessing that while Thunder is dispersing, you can attack enemies with melee attacks. If you're successful with the melee combo, Aqua will release Thundagun. That's just my take, though! We never saw him before the Engine switch, so yeah. Sorry, I meant ever since the whole next gen leap in general. Looks less club house more kh mouse. OP updated with translations from Saken! Very excited to try my hand at Thundagun!